UC was recognized as a state and then regional winner in May. 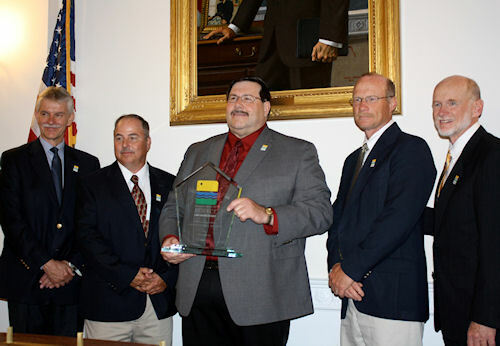 The United Cooperative South Beaver Dam agronomy location was recognized by DuPont Crop Protection as the 2011 NATIONAL Environmental Respect Award winner at a special ceremony in the Longsworth House Office Building near Capitol Hill in Washington, D.C. on July 14. AWARD WINNERS: The United Cooperative South Beaver Dam agronomy location was recognized by DuPont Crop Protection as the 2011 NATIONAL Environmental Respect Award winner at a special ceremony in the Longsworth House Office Building near Capitol Hill in Washington, D.C. on July 14. United Cooperative President and Chief Executive Officer David Cramer (center), Vice President of Agronomy Operations and Crop Protection Procurement Kevin Williams (inside left), and Vice President of Agronomy and Marketing Sales Jim Kemink (inside right) were present to accept the award from the Environmental Respect Award program directors. United Cooperative was chosen from five regional farm-supply business winners from across the country for the honor. United Cooperative President and Chief Executive Officer David Cramer, Vice President of Agronomy Operations and Crop Protection Procurement Kevin Williams, and Vice President of Agronomy and Marketing Sales Jim Kemink were present to accept the award. "I'm honored that we were named the winner," said Cramer while accepting the crystal trophy. "This is really special." Cramer also recognized South Beaver Dam's employees for their role in organizing and maintaining good environmental stewardship at the location. "This is a team effort," said Cramer, in reference to winning the national ERA award. "I would like to thank our employees for making this possible. Most of them couldn't be here tonight because they are back home working, but we wouldn't be up here in the first place without their contributions." United Cooperative's South Beaver Dam location was recognized as a state winner in May and announced as a regional winner one week later. For 21 years, the Environmental Respect Awards have been the agricultural industry's highest recognition for environmental stewardship among U.S. agricultural retailers -- those who serve farmers and ranchers with the nutrients, pest control, and agronomic information critical to effective crop production. A panel of industry experts gathers each year to recognize achievement in environmental stewardship, professional excellence, and community involvement. United Cooperative won the NATIONAL award based on evidence of excellence in site design, in-plant storage and handling procedures, emergency preparedness and response, proper application, and leadership in safety and stewardship among customers and employees. United Cooperative's South Beaver Dam state-of-the-art agronomy location, designed by Cramer and Williams, includes 28,500 tons of liquid crop-nutrient storage and 24,000 tons of dry crop-nutrient storage. South Beaver Dam agronomy operations, including the custom application department, are managed by John Hying. "The cooperative, in its entirety, strives to be good stewards of the environment every day," commented Cramer. "Even when I'm in the planning and building stages of additions here at the cooperative, environmental safety is always a priority." "DuPont is pleased to congratulate the winners of the 2011 Environmental Respect Awards and applauds their accomplishments in environmental stewardship," said Rik Miller, president, DuPont Crop Protection. "These leaders are helping to advance environmental safety and the safe use of agricultural products, and we hope they will inspire others who share our passion and desire to elevate environmental stewardship around the world." Formed in 1936, United Cooperative is a full-service cooperative offering feed, grain, agronomy, and energy products and services to Wisconsin farmers and consumers. United Cooperative has locations in Baraboo, Beaver Dam, Deerfield, Hartford, Horicon, Hustisford, Iron Ridge, Johnson Creek, Mayville, Pickett, Poynette, Prairie du Sac, Randolph, Reedsburg, Ripon, Rock Springs, Sauk City, South Beaver Dam, Watertown, and Wyocena.